Standing in a bed of flowers inspired by the millefleurs (thousand flowers) form of Gothic art, Flora is the goddess of abundance. She is the personification of summer, standing barefoot in a flowing robe, a bouquet of fresh flowers in her hand. Edward Burnes-Jones and William Morris jointly designed Flora in 1885. 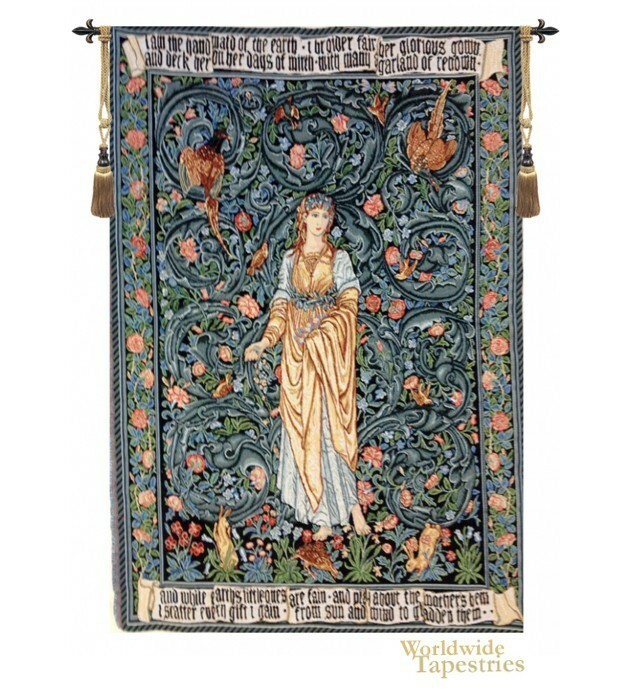 The tapestry, based on the art of William Morris Flora, features this inscription in a richly defined Gothic type: I am the handmaid of the Earth, I broider fair her glorious gown, and deck her on her days of mirth, with many a garland of renown, and while earth's little ones are fain, and play about the mother's hem, I scatter every gift I gain, from sun and wind to gladden them. This tapestry is lined and has a tunnel for easy hanging. Note: tapestry rod and tassels, where pictured, are purchased separately. NOTE: The smallest size (as indicated below) has no border. Dimensions: W 28" x H 43"
Dimensions: W 36" x H 54"